Click image for printable size. Brooklyn  Yesterday Brooklyn Borough Hall was the venue for an unprecedented set of circumstances: the singing of Ukraine's national anthem, raising of the Ukrainian flag  and a Ukrainian-speaking borough president. With valiant effort and a good sense of humor, Marty Markowitz braved several phrases in Ukrainian as a mark of respect for Ukrainian American immigrants and their contributions to the ethnic kaleidoscope that has been characteristic of Brooklyn's long history. On the heels of a similar proclamation issued by Mayor Bloomberg earlier this month, Mr. Markowitz proclaimed Friday, September 9, 2005, to be "Ukrainian Day" in Brooklyn. 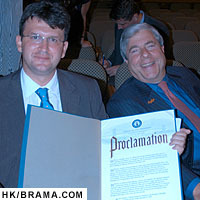 The proclamation was presented to Consul Andrii Nadzhos, representing the Consulate General of Ukraine in New York. 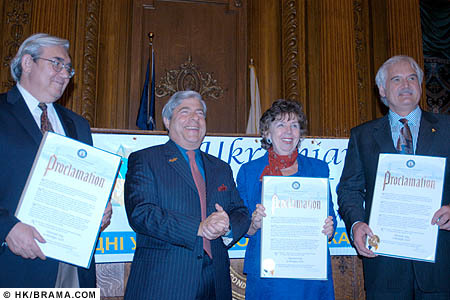 In addition, Mr. Markowitz conferred the proclamation upon the Ukrainian American Coordinating Council (UACC) and the Ukrainian National Women's League of America (UNWLA), two community umbrella organizations that have been cooperating on initiatives to orchestrate the Ukrainian Day programs in New York City, including the mayoral and borough president's proclamations. A representative of the Ukrainian Congress Committee of America (UCCA), another umbrella organization, also accepted the proclamation on behalf of its membership. Organizers of the events associated with the Ukrainian American Heritage Days program invite the public to participate in the various events taking place between now and September 11. A seminar on the aftereffects of Chornobyl is scheduled today (4PM) at the Eye and Ear Infirmary in Manhattan. On Friday, a gala concert commemorating the 14th anniversary of Ukraine's independence takes place at 8PM in Kingborough Community College, Brooklyn. Saturday, for the first time, a Ukrainian float with Ukrainian folk dancers will participate in the Labor Day parade along Manhattan's Fifth Avenue. The series culminates on Sunday with a special event honoring the victims of 9/11, the victims of hurricane Katrina, and an anniversary celebration of the UNWLA's magazine, "Our Life". See the Brama calendar for more information about Ukrainian American Heritage Days.